We’ve had a breakthrough today. You’ve heard me whine about how hard it is to get Jack down for a nap lately. He squirms, fusses, kicks, throw his paci, etc., while we try to rock him to sleep. Eventually he exhausts himself and passes out, but it takes forever and is really frustrating for everyone involved. Anyway, I started thinking that it might just mean that he’s just getting too big to be rocked. Maybe he’s uncomfortable, annoyed, wanting to spread his little 9-month old wings… Plus I’ve been re-reading Healthy Sleep Habits, Happy Child, and based on the info inside, Jack’s daytime sleep habits are a total trainwreck. Tell me something I don’t know. So. This morning I tried to rock him before his morning nap, per usual. He fought and fussed, per usual. I laid him in his crib, drowsy but awake, and walked out. He immediately started crying… and continued for FORTY-FIVE MINUTES. The sleep book says to let them cry for no more than one hour. I figured that I would try this one time, and if he was still crying after an hour then I would burn the book and go back to rocking. But after forty-five minutes? Silence. Sleep! And for two and a half HOURS! He was obviously exhausted, and hopefully not just from crying. So maybe that was just a fluke, but tonight I laid him down drowsy but awake again- and he rubbed his eyes and went right to sleep! Sorry for all of the baby talk. That’s just pretty much the most exciting happening in my life at the moment… it’s amazing how much your life revolves around things like sleep once you have a kid. Sleep and poop, but we won’t get into that one. At least not tonight. Onto the eats. Today was one of those great lazy, rainy mornings. I had a nice big mug of coffee (w/ pumpkin pie syrup!!) 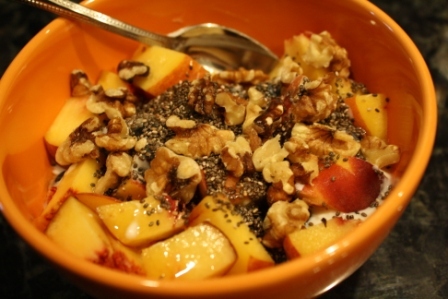 and yogurt with diced peach, blueberries, chia seeds, walnuts and honey. Lunch was a product of what was in the fridge that needed to be consumed ASAP, namely a leftover pork chop and some baby carrots. 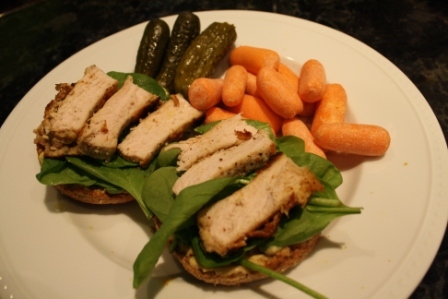 Open-faced Ezekiel English muffin topped with hummus, Gulden’s, baby spinach and sliced pork. And baby carrots and pickles on the side. One of the many pluses of the 2-hour nap is that I was able to get some dinner prep out of the way. I went ahead and assembled turkey meatballs so that we could just throw them in the oven tonight. They turned out really well! Even Jack liked them. We’re trying to cut back on carbs in the evenings, so we just had them topped with tomato sauce and mozzarella… but they would be great with pasta or in a sandwich!! Meatballs hold a special place in my heart. Yum yum. Along with roasted green beans. New favorite side: Roasted green beans topped with olive oil, kosher salt and garlic powder- eaten with ketchup. They’re like healthy fries! But I think we little overboard on the beans. 2. In a large skillet, heat olive oil and add garlic and onion. Saute onion for a few minutes, until slightly translucent. Add baby spinach (in batches, if necessary) and cook until it wilts. 3. 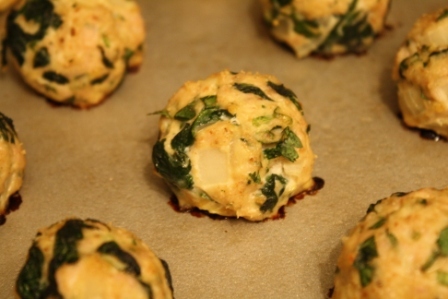 In a large bowl, combine spinach mixture with remaining ingredients and mix well. If too moist, add more breadcrumbs. If too dry, add a little water. 4. Spray a large metal baking sheet with nonstick spray. 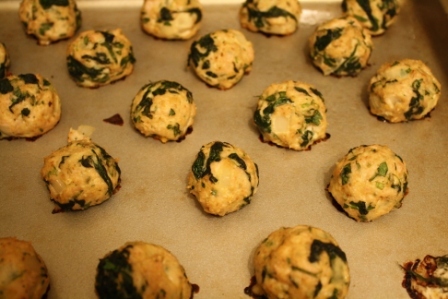 Scoop turkey mixture and roll into small balls (I used a cookie scoop for even sizing). Place evenly on baking sheet and bake for 30 minutes. So so so easy. And delicious. Next time I’m double the recipe and freeze some of the meatballs for later. Three day weekend!!!! Any fun plans? I think we’re heading to the lake at some point, and Jack has his big 9 month checkup tomorrow. I’m excited to see how much he weighs now- he’s quite the little chunkster. This entry was posted in September 2010 and tagged Jack, Recipes, Turkey. Bookmark the permalink. Ok… so I swear by that book. I am not kidding… I always change things up and then end up having to go back to it. Also, those roasted green beans look AWESOME and my kids would LOVE them… they are green bean and ketchup nuts…why not put them together? How long should I roast them? Okay- here’s my super complicated recipe. Put beans in bowl, add olive oil and seasonings, bake at 400 for about 15-20 minutes (shake pan a few times throughout cooking). You want to see a few beans getting a little brown and blistering. I’m curious too. How long do you roast your green beans? I’m super excited for the long weekend. I’ve got more Amish bread to bake, uhh… This time I’m going to use butterscotch pudding. Of course, the weekend would not be complete without dinner and a movie and grilling out. I love reading about motherhood from your perspective (I’m going to try to remember all this stuff for years down the road!) It’s great that you gave something new a try and that it worked. I bet you could use 2.5 hours of downtime these days, huh? UM I totally get you on the sleep thing. My life currently revolves around sleep (or a lack thereof). I’m reading “The No-Cry Sleep Solution” right now in hopes of getting my 4-month old to sleep longer than 1 hour at a time at night. Ahhhh! To add my 2 cents – I love the that book!! That is the one I most closely adhere too. 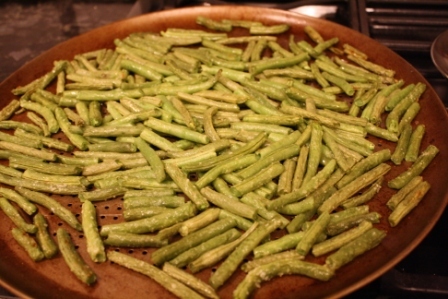 And the green beans look great, we will have to try the recipe. 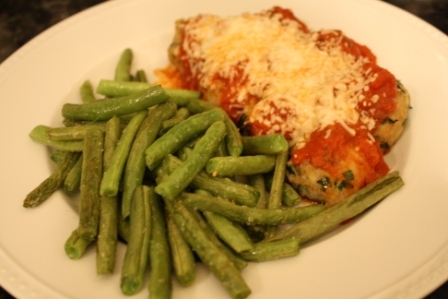 I made those turkey meatballs tonight and they are FANTASTIC! Thanks for sharing the recipe. And I used to babysit for some people who told me that no matter what, after I put their 9 month old daughter down for the night to not go back in that room no matter how much she fussed and cried. By the time she was 3 or 4 she was asleep the INSTANT her head hit the pillow. So it really is worth it!